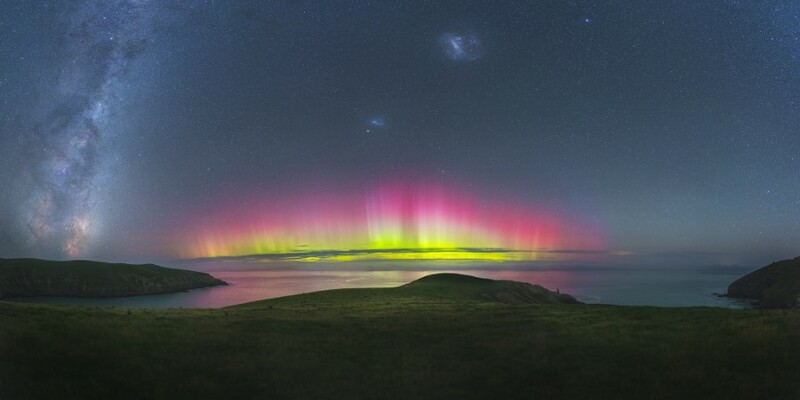 From auroral lightshows to distant galaxies, view the 2018 People's Choice Winner. We are pleased to announce ‘Holding Due North’ by Jake Mosher as the winner of the People's Choice award. Jake’s image was chosen out of 24 selected by the Museum, with the public casting over 22,000 votes online and in the exhibition gallery. 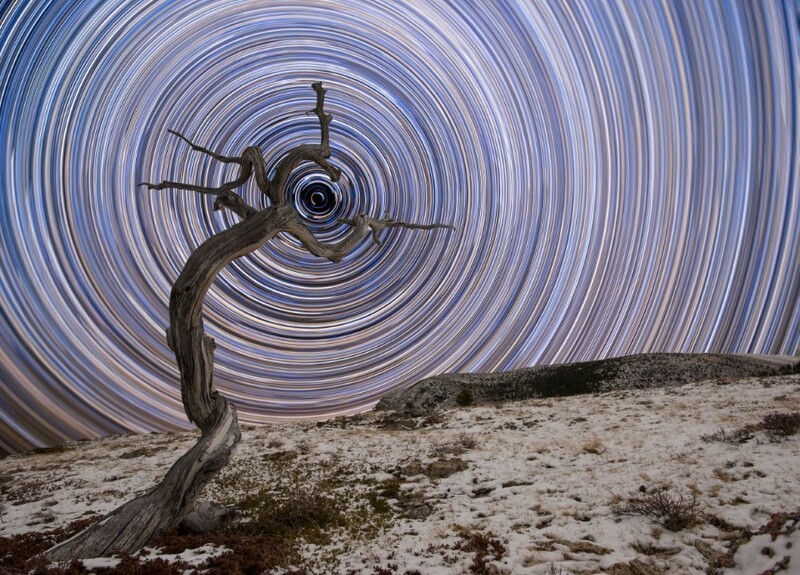 In this image, a weathered juniper tree in Montana’s northern Rocky Mountains stands in early winter, while the sky above is filled with star trails. I noticed this tree a couple of years earlier and told myself that I had to go back for one of these shots. It took several test frames of long exposures to make sure that I had Polaris in the right place, but eventually things lined up the way I had imagined. There was enough moonlight to give nice detail to the foreground, yet still plenty of dark skies to allow a high enough ISO to capture lots of stars. 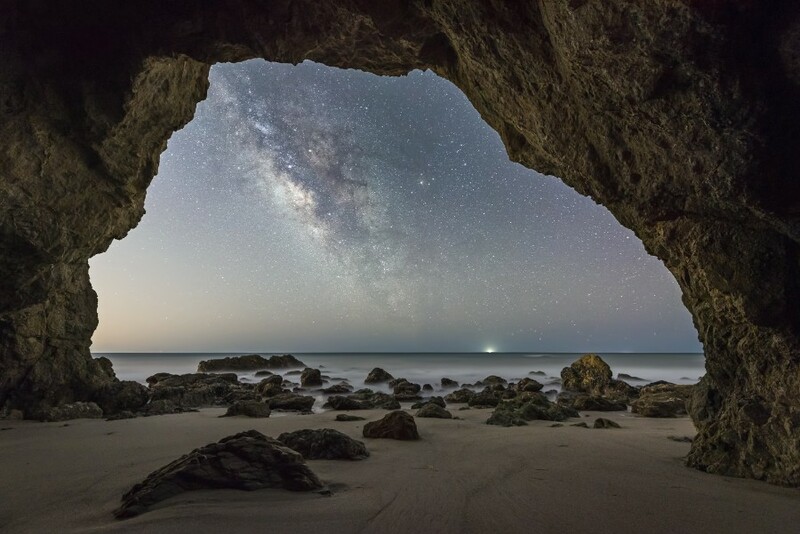 I framed the Milky Way inside a sea cave. The Milky Way isn’t the brightest from this location as it is within Los Angeles county and only about 25 miles away from the heart of downtown LA. Given the amount of light pollution it is still amazing to be able to make out the Milky Way core. I planned this shot for some time as I needed the perfect conditions of low tide and clear skies to be able to pull it off. This required two exposures: one to capture the details of the dark cave and one for the Milky Way. I had spotted this composition during the day and had worked out where the Milky Way would be positioned in relation to the rocky headland. Since it was so dark, I decided to capture two separate exposures, one for the sky and one for the foreground, and blend them in post-processing to achieve the desired result with a more even exposure. The only form of artificial light was from the Lizard lighthouse with its light beams cutting the horizon. 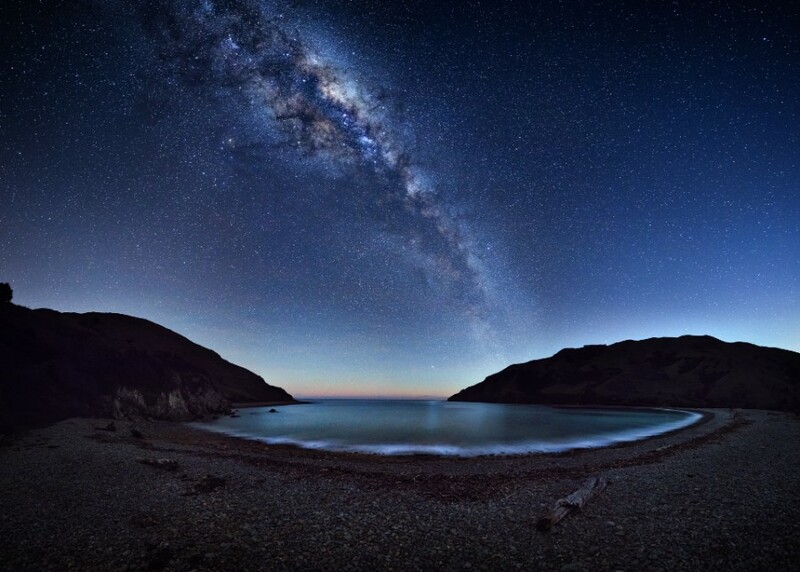 The Milky Way was high in the night sky, with its light reflecting in the bay below. I didn’t have much time to photograph it before the moonrise washed out the sky, but I was able to do a large multi-row panorama made up of 42 individual images, which I later stitched together to create this one image. It’s fantastic to observe the Milky Way on a clear night with only some cumulonimbus cloud near the horizon. 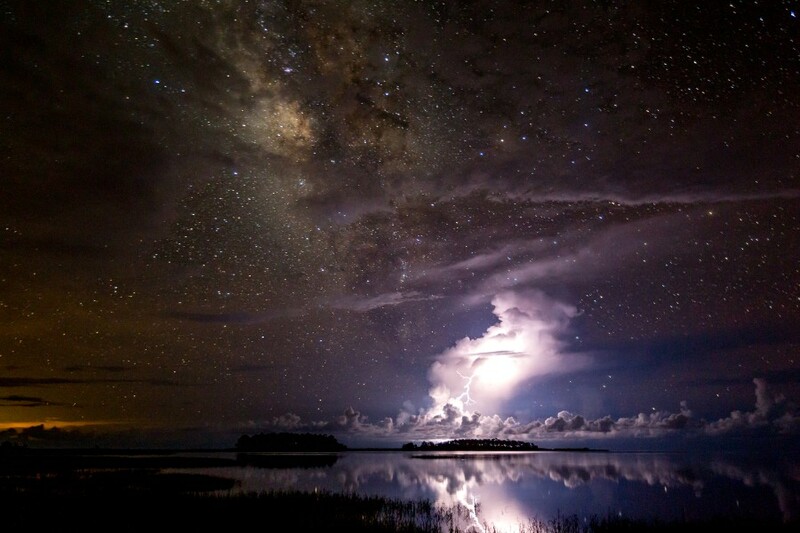 In this image, the Milky Way is a static feature in the sky, while the thunderstorm is active, so it perfectly combines stable and moving objects. For six years, I lived just five minutes away from this beautiful place but this evening was something special. The weather was so calm and quiet, which made me think that time was standing still. Only the sound of some birds flying by reminded me that I was still on Earth. It is truly mesmerizing to see an orange glow in the middle of the night. This is how dark the sky is during the summertime in Denmark. Standing atop the Passo Falzarego shooting Ursa Major on a freezing night towards the end of Nautical Twilight, I decided I needed to get closer. Reaching for my other camera with a 50-mm lens attached to it, I was startled by a flash in the sky; time seemed to slow as I stood in awe and watched it fizzle out. After it had vanished, and thankfully not into the valley, which it looked set to do from this altitude, I realised that I had heard the shutter click while watching it – I had hit an exposure before reaching for my other camera! 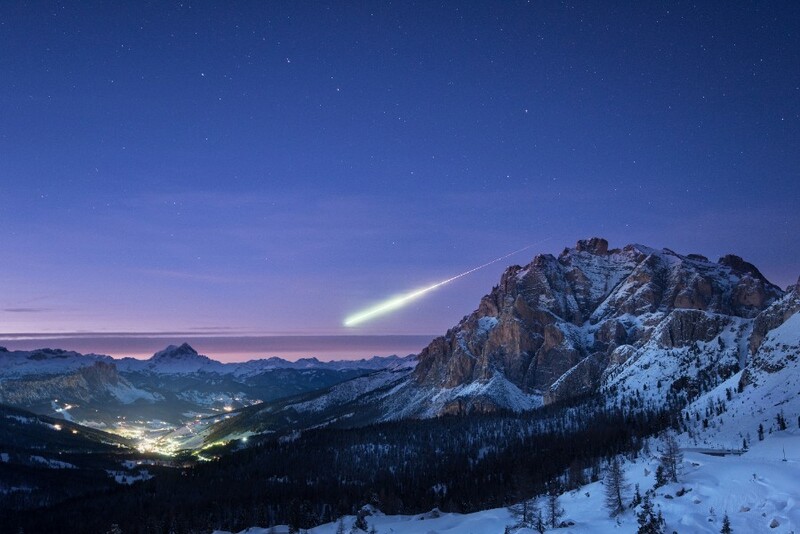 A rush of excitement hit me as I went to check the LCD screen, and there it was, the meteor below the dipper, over a snow-laden landscape with a slight pink hue from the jaded afterglow. Naturally I smiled a lot. I then did a long exposure to bring out grain-free detail in the foreground. 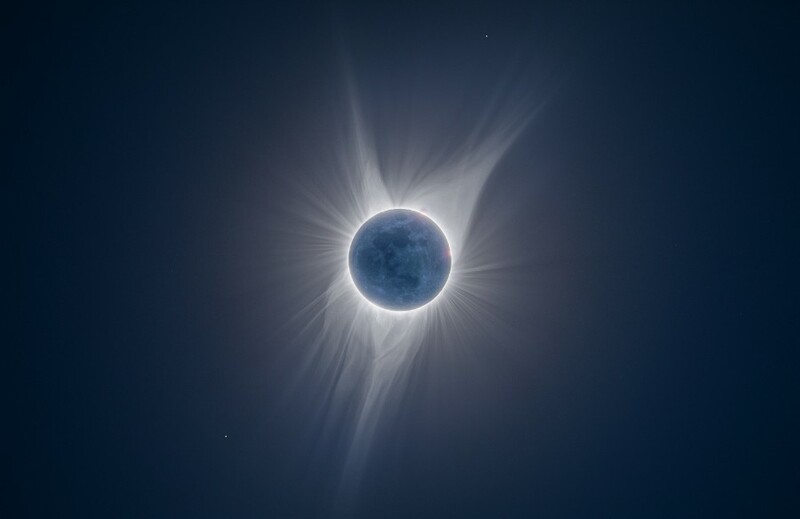 solar corona, but the newest possible of new moons, seen here illuminated by sunlight reflecting off the Earth. 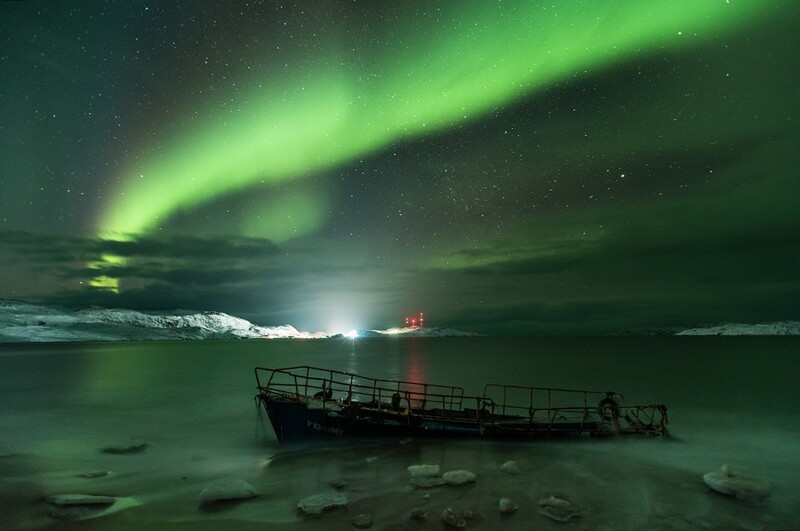 Our company of three travelled 2,000 kilometres to capture the Northern Lights. We went from the city of Yaroslavl in Russia to Teriberka on the coast of the Barents Sea, in the Arctic Circle. For four days we were unlucky with the weather, it was snowing hard and heavy clouds were rolling above the sea. Finally the sky cleared up and in the evening we saw what we had come such a long way to see! 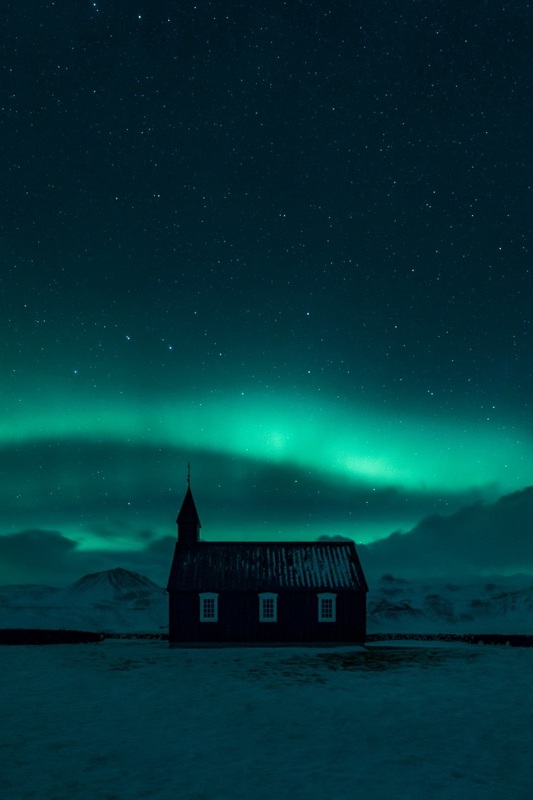 The Northern Lights were in all their glory, twisting gently in the starry night sky. Geomagnetic activity was pretty weak, but the sky was shining beautifully! All photos were taken on the coast of the Barents Sea, in Teriberka, where we stayed for five days. The tide eventually came in and soaked our feet but we were delighted with what we saw! My last trip to Iceland was probably one of the most challenging trips I’ve been on so far! The weather was a real pain and this night on the Snæfellsnes Peninsula was a nightmare! Strong gales made it almost impossible to shoot – I have so many blurred shots – but hard work pays off! I got the shot of the Black Church at Búðir and it turned out better than I had hoped. 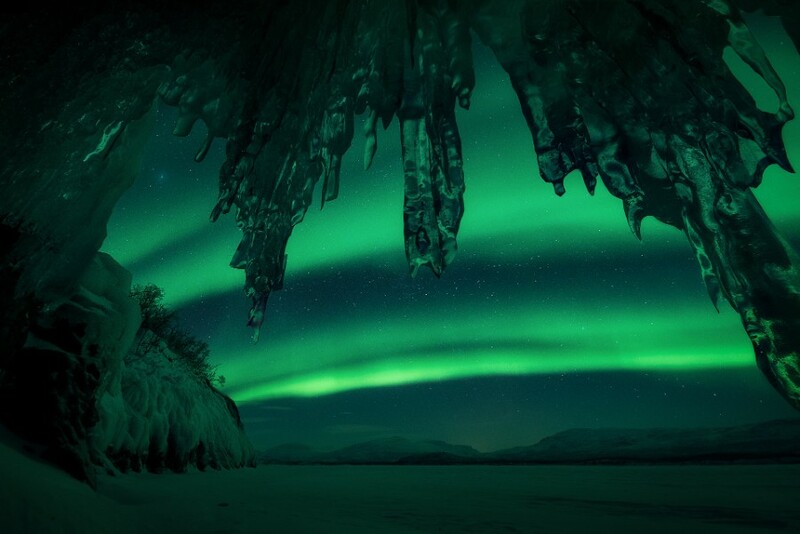 This place is just incredible beneath the stripes of the Aurora Borealis and the bright stars on the night sky! 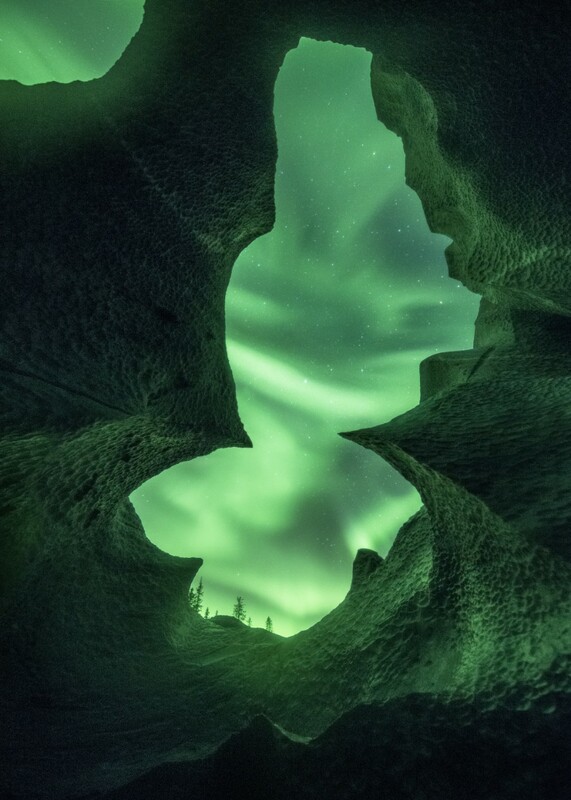 I spent an amazing evening squeezed into a tiny cave on lake Torneträsk in Swedish Lapland, minus 26 degrees Celsius and a magnificent aurora display. It was a major challenge to get everything in focus and I had to combine multiple exposures to be able to get everything sharp. The end result was worth the effort. This is a very magical scene. During February this year I visited Stokksnes on the south coast of Iceland. The goal for the night was to catch the stunning Aurora Borealis. There are a lot of dunes here and snow had melted into the pool. Suddenly, clouds emerged from the nearby mountains and floated across the sea as the Aurora Borealis started to powerfully explode. I shot this at Southern Bays near Christchurch, New Zealand. There had been auroral displays for a few nights but I was unable to shoot. I thought I’d try my luck and head out even though the Kp index wasn’t very high. I set up the iPano and programmed it to start on the bottom row. There wasn’t much activity during the test shots but by the time the iPano robotic panoramic head got to the middle rows the aurora had really flared up! Very lucky! I don’t usually climb down into caves when there is a geomagnetic storm going on in the sky, but this time I’m glad I did. It was a very rare opportunity to photograph the aurora over these rock formations, known as Marmorslottet (The Marble Castle). Water spray from the glacial river Glomåga made it a challenge to photograph, but it also gave the rock a more reflective surface. I realised it might be possible to image surface details on every planet in our solar system during just one year from my own back garden. In January, eight months after opposition, I had captured Mars sporting a tiny polar cap and dark features. Next, Venus in ultraviolet (UV), then Jupiter and Saturn, all showing rich cloud features. Then in September I had imaged details on the rocky face of elusive Mercury for the first time. One still night in early November I managed to record Uranus’s distinct polar region and the set was complete! The more challenging planets – Mercury, Uranus and Neptune – required IR imaging to bring out surface details and have been colourised to match their more normal visual appearance. Venus, using a UV filter to image the clouds, is shown as a greyscale image to also match its visual colouration. 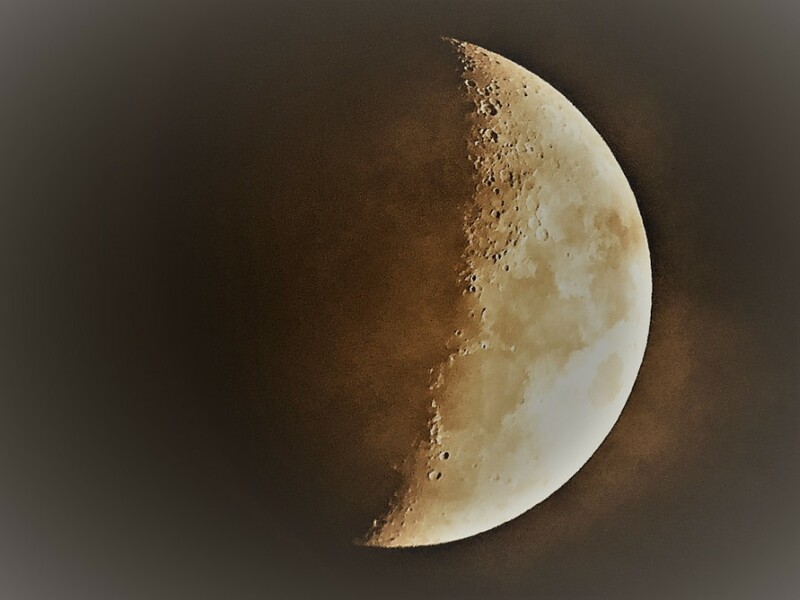 For comparison, all the images are displayed at the same angular image scale, at the same relative sizes as they would appear to the eye through a telescope. 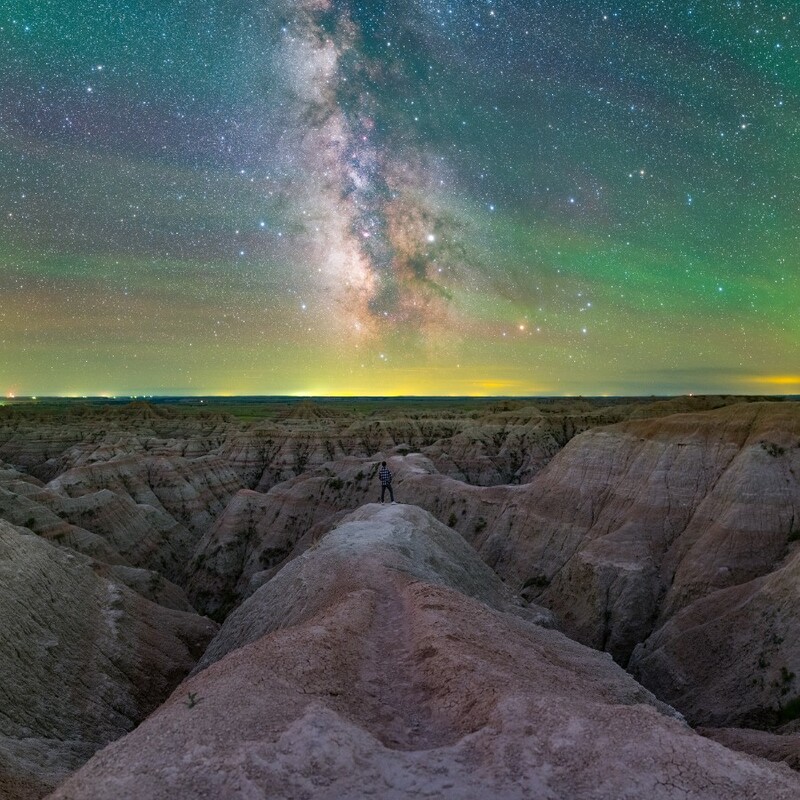 After a long-haul drive, we finally reached the end of our journey chasing the summer Milky Way as our path terminated naturally in the rugged landscapes at Badlands National Park. 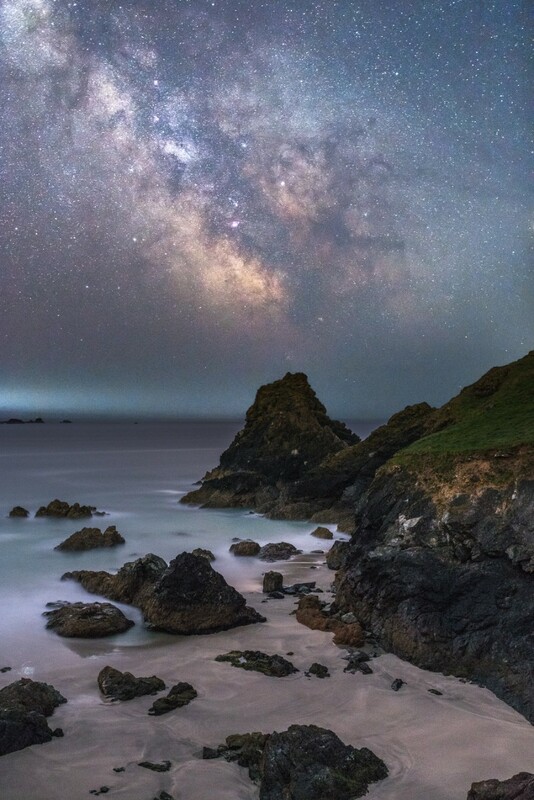 This image is a panoramic view of a six shot composite, three for the sky and three for the earthly foreground, all of which were taken successively using the same gear and equivalent exposure settings, from the same location, within a short period. Files were initially processed in Lightroom for lens correction only, followed by merging to panorama in Photoshop. Final retouching was applied back in Lightroom, including white balance correction, basic toning and local adjustments. 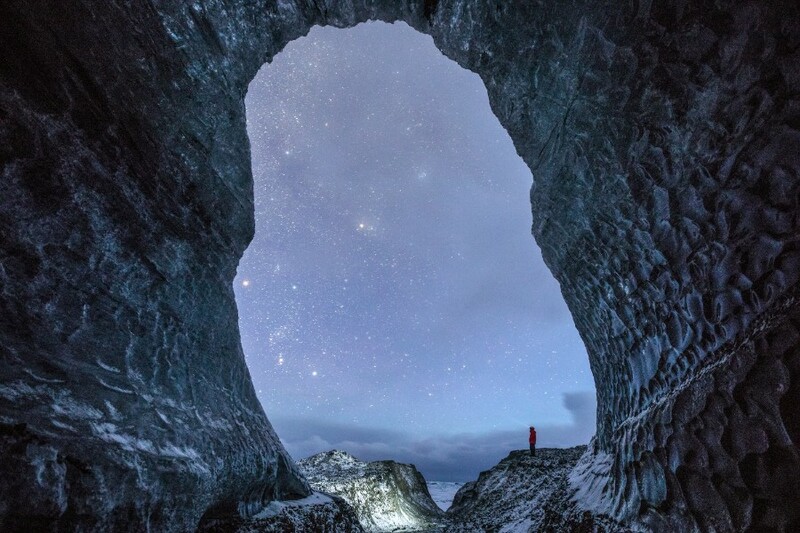 This image was taken during an evening exploring the remarkable underbelly of the Breiðamerkurjökull glacial tongue in Iceland. Often when composing an image, I like to just stop in silence and look, often for extended periods. When I was in the ice cave, with no sound and no one around, it was incredibly peaceful. The longer I remained still and just watched, the more my eyes adjusted to the stars twinkling at the cave’s entrance. This image is homage to the peace and wonder I felt. 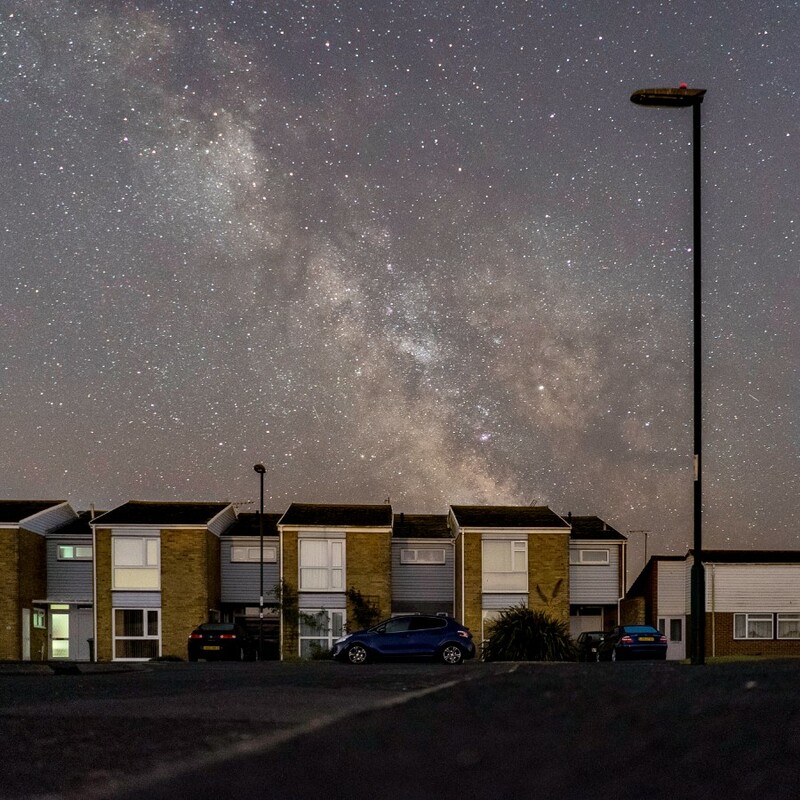 Despite the unlikely appearance of the Milky Way rising beyond a suburban terrace, this image is a single frame and not a speculative composite. Situated on a south-coast peninsula, these houses fall within a part-night street lighting zone and when the lights go out there’s no glow beyond until you reach continental Europe dozens of miles across the English Channel. 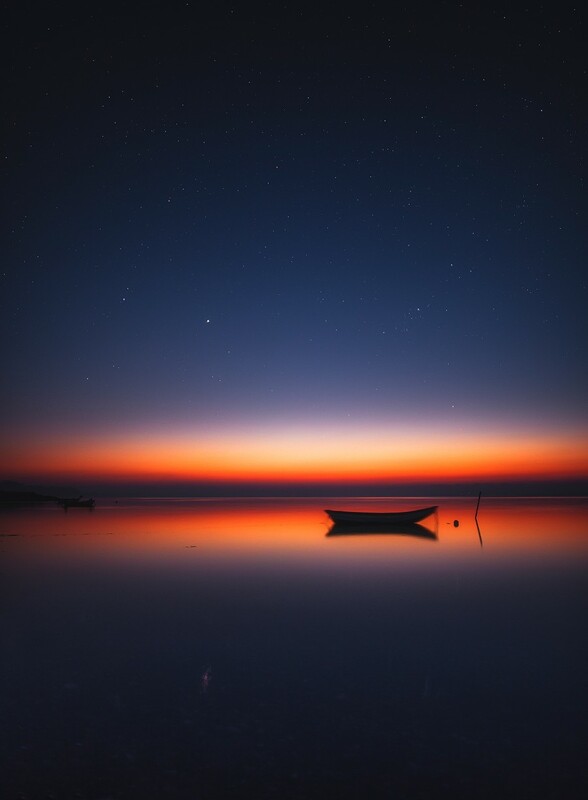 That the image looks so incongruous, almost surreal, only serves to highlight how accustomed we’ve become to the loss of night-sky views through light pollution. It was a conscious, compositional decision to feature the unlit streetlamps, suggesting how it might be possible to reverse this pollution and restore awe-inspiring views of the stars, and the widespread societal benefits that are increasingly believed to accompany darker nights. 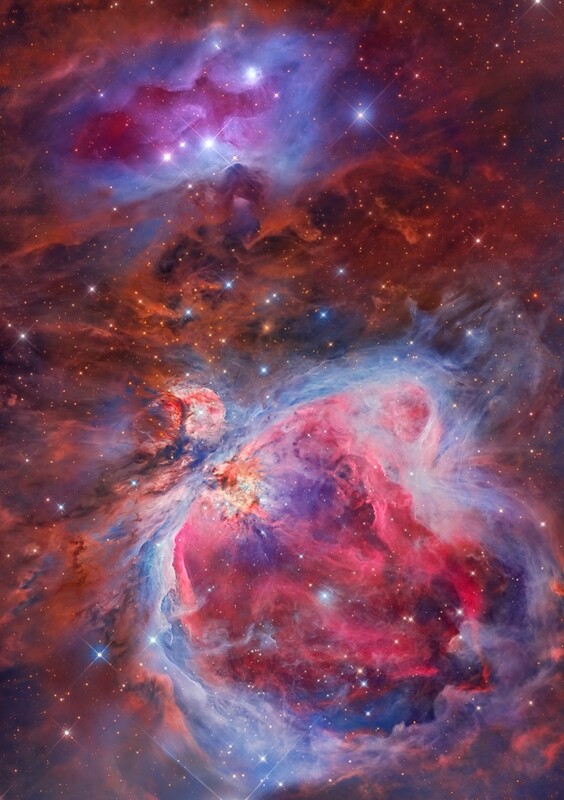 The Orion Nebula, also known as Messier 42, M42, or NGC 1976, is a diffuse nebula situated in the Milky Way, south of Orion’s Belt in the constellation of Orion. It is one of the brightest nebulae and is visible to the naked eye in the night sky. This image is the result of the efforts of two astrophotographers, who chose a common target of the Orion Sword area (one of the most beautiful areas of our night sky) using different equipment from their observatories, which are located hundreds of kilometres from each other. 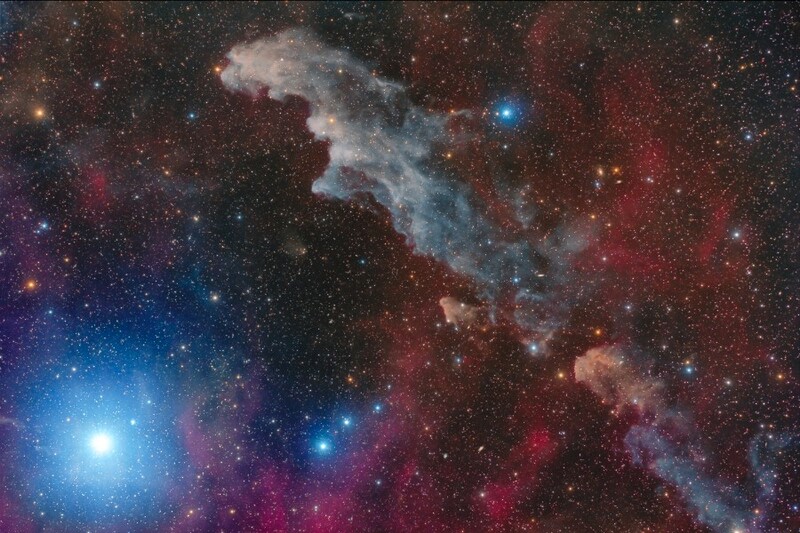 The field of the Witch Head Nebula and Rigel was at the top of my astrophoto wishlist. Two nights under the dark Namibian sky gave me the chance to take this picture under perfect conditions. 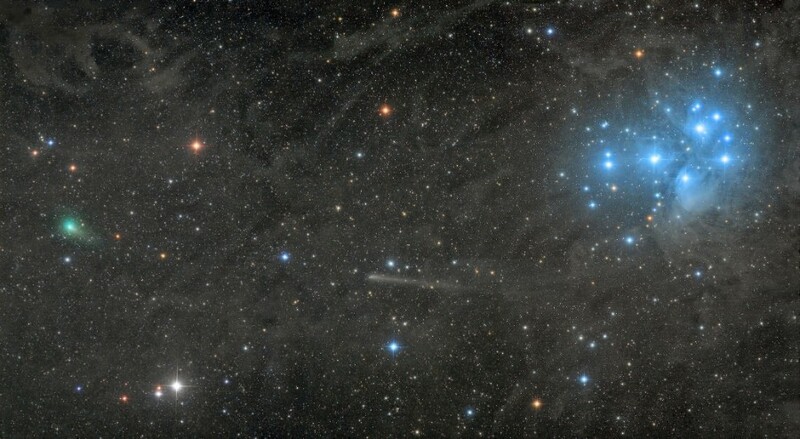 This very faint molecular cloud is lit up from Rigel, which, not including the Sun, is the seventh brightest star of the sky and the brightest star in the constellation of Orion. By using a full-frame camera, I could include both, but the challenge was keeping the brightness of Rigel under control. The whole scene includes some galaxies and faint red hydrogen emission. Almost 5,900 light years away, towards the southern constellation Centaurus, lies a large beautiful nebula known as the Lambda Centauri Nebula. The intense light from stars in a young open cluster cause the surrounding gas to glow with a magenta hue from emission lines of ionised hydrogen atoms. In the centre of the image, seemingly suspended against a dramatic backdrop of glowing gas, is a group of Bok globules, which are dark, dense collapsing patches of gas and dust where new stars are frequently born. Discovered by the South African astronomer A. David Thackeray in 1950, these are now known as Thackeray’s Globules and are a favourite target for backyard astrophotographers and large professional telescopes alike. The largest globule is actually two separate clouds that overlap slightly, as seen from our vantage point. While they appear small in the context of the grand nebula, these overlapping globules are each 1.4 light years across and together they contain more than 15 times the mass of our Sun. This is my first proper look at the Moon. I got a new telescope for my birthday four days ago but it has been too cloudy to see. This evening was the first time there was a break in the clouds and I saw this amazing sight, it was so awesome and bright I had to get my iPad and put it up to the bit you look through and take some pictures. It was very cloudy, which made it difficult to take the pictures at the right time. Keeping the iPad in the right place was also hard and my grandad had to keep moving my telescope because the Moon kept moving away. It was really cold outside but I’m glad I got to see the Moon. I’m going to send a copy to my teacher because I’m proud of this picture. What do you do before an exam at school? For me, I took this image on an early Monday morning at 5.30 a.m., I was very lucky to get the meteor because I was shooting on a 50-mm lens. On the left side you can see the Moon, which was only illuminated at 13.5%. 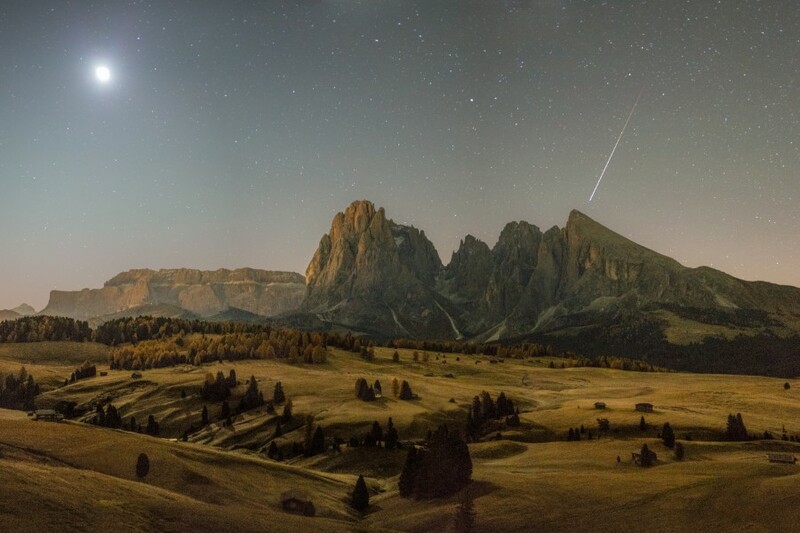 I went photographing on that morning because I wanted to capture the stunning landscape of the Alpe di Siusi with the autumn colours and the Moon shining on it. In this image, I captured a very rare conjunction of two bright comets passing the famous Pleiades star cluster in Taurus at the same time. Comet C/2017 O1 (ASASSN) is far left while C2015 ER61 (PanSTARRS) is in the centre. Both comets have strikingly different appearances. 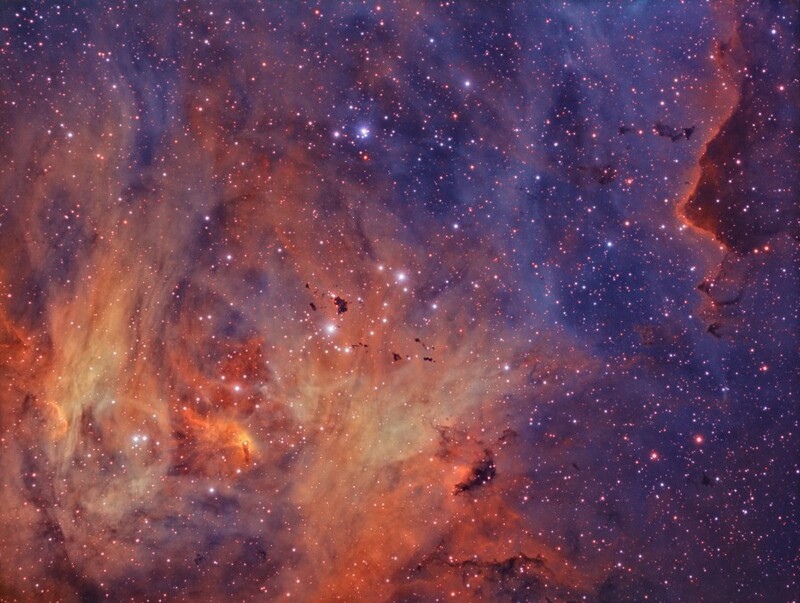 The whole region is embedded in the faint nebulosity of the Taurus Molecular Cloud.